Memorials: Millfield School, Thornton Cleveleys. I very nearly became a teacher at Millfield School. The actual interview was one of the first "proper" interviews I ever had. However not to be. Little did I know that 20 years on I would be back. I gatecrashed the unveiling ceremony. Almost no-one knew who I was, certainly not the civic dignitaries that were there. In fact I may have been the ONLY person there who was not specifically invited. 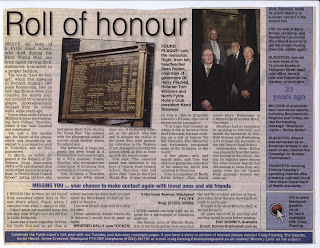 There was a 1 inch column in a corner of our local paper, the "Evening Gazette" announcing that this memorial had been found, restored, and rededicated. Couldn't resist. 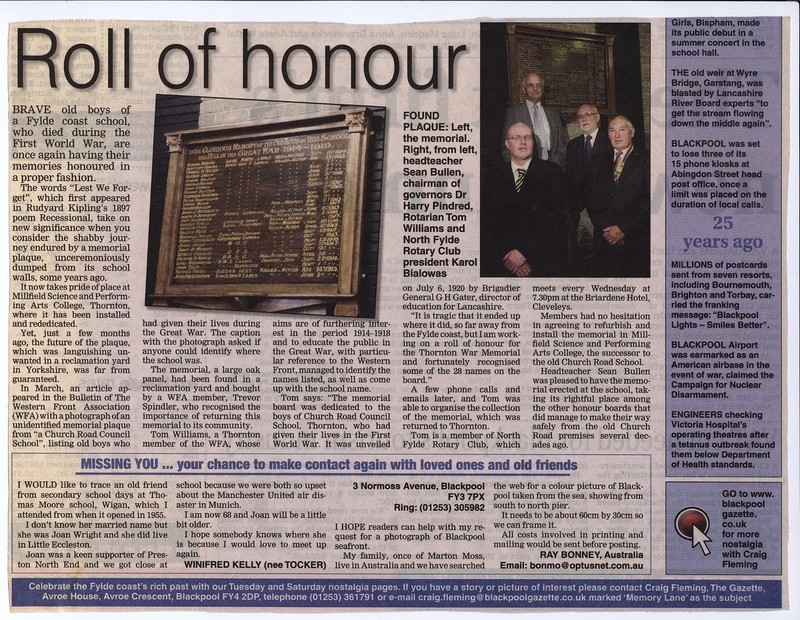 There was a considerably larger article in the Gazette later. I am in big danger of standing on toes here because I believe one of the members from Thornton Cleveleys Rotarians is working on a history of the three memorials in this close knit community. I have much to thank Tom Williams for. Information freely given - but of course he retains the copywrite. I am not sure that he was aware that I have now recorded and photographed quite a few of these memorials - and perhaps he was unaware that this would end up on the internet. The memorial at Four Lane Ends has now been published too. I suspect that there will be names that are on both memorials. My purpose has never been to repeat verbatim what is already on the internet, but to try and give information and photographs to people researching their past. A starting point perhaps. Thornton has a fascinating history. There is much photography to be done. It has an everchanging urban landscape. These are my photographs of the small yet quite poignant event at the end of what seemed like a normal school day. Amongst the papers given me on this evening was a transcript of the original speech given by Brig-General Gator, published in the in the "Fleetwood Chronical, Fylde News and Advertiser" Friday the 9th of July 1920. Again I feel copywrite may well still be an issue - even though the paper is now defunct. I do not believe this speech is on the internet. It seems from research that Brig-Gen Gator was in charge of the artillery Ordnance) at the assault of Sevastopol. (This was the only reference to him on the internet). However this link provides a good overview of the battle itself. This blogpage is still in development. Information is forwarded to the National Inventory of War Memorials.I took other photographs from the schools history and I have placed them in this link here in the Datastore.